The Liverpool School Sports Partnership (LSSP) worked tirelessly to ensure that the Year 3 and Year 4 indoor competition would take place during 2014. The first round of competition took place in April and early May. More teams than ever had entered this very highly - competitive competition. Only the winners from each heat would compete in the city final. St Michael in the Hamlet won their first round convincingly and looked forward to another city final. On the 14th May the six best indoor athletics teams from across Liverpool would contest the city final at Everton Sports centre. All the teams had earned their place in the final by winning their heat. The teams were; St Sebastian’s, Lister Drive, King David, St Gregorys, St Cuthberts and St Michael in the Hamlet. Two of the teams had been previous champions (Lister Drive, St Michael in the Hamlet). The event started with the girls’ races and the boys’ field events. The first event was the over and under obstacle race. This is always an exciting start to the event-it gets the pulse racing. The race started and it was very close, St Sebastian’s lead most of the way and St Michael in the Hamlet timed their race to perfection taking the lead at the crucial stage as the last runner took over. The girls’ team edged into the lead and held that position until they crossed the finishing line. A great start to the competition. The 1 lap ‘A’ race was next and the girl’s captain, Lushikia Anderson won in very convincing style. This was a great example, which filled the rest of the girls’ team with confidence. Olivia Wilde won her 1 lap ‘B’ race. This winning streak continued with both 2 lap runners winning in style. The three lap race was very exciting with, Lois Dickenson coming in third place. The last event was the relay race. The race started and the standard of the teams was very high from the off, with St Sebs and St Michael’s the two front runners. This continued until the third changeover and St Michael in the Hamlet just pushed on changing the baton in first place Maya Williams increased the lead and crossed the line ahead of the other teams. The girls’ field events took place at the same time as the boys’ team races. Which started with the over and under obstacle race. St Michaels lead from the off with Josh Mitchell bringing the team home. The winning continued into the 1 lap ‘A’ race a very convincing win from the boy’s team captain, Ryan Charnock. Both 2 lap races were very close with Luke Welch and Edward Quine winning in very competitive races. The 3 lap race brought a third and fourth placing. The final event of the whole competition was the boys’ relay race. St Michael in the Hamlet has a very good record in this event. The race started and St Michael in the Hamlet led from the start. This was increased with each baton change (the team won in great style). St Michael in the Hamlet athletic team won by a massive 23 points. An amazing performance by the athletics team in becoming ‘City of Liverpool Champions 2014.’ This is the second time in the history of the competition that both our indoor athletic teams have won City Championship titles (the year 5 and 6 won theirs in early May). Since competing in the Year 3 and Year 4 competition St Michael in the Hamlet have reached the final four times and the results have been : 3rd, 1st,2nd and 1st a super record!!! 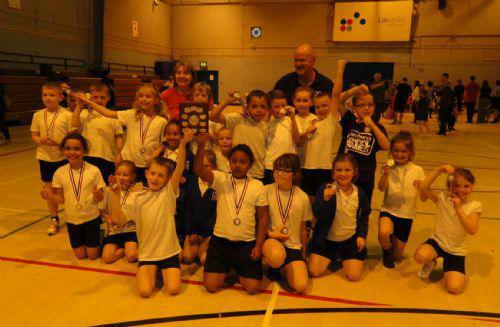 The young athletes have had an amazing season so far winning both Indoor City titles with, 2nd place in the county. We are looking forward to competing in the outdoor athletics competition; fingers crossed we will have some city champions in our team.